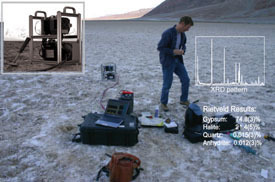 The combined CHEmical and MINeralogical capability is reflected in the instrument name. 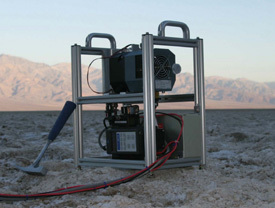 CheMin is a miniature X-ray diffraction instrument that will determine the mineral structure and elemental composition of rocky materials of the solar system. It will be used to identify and quantify all minerals in complex natural samples of the Martian surface, such as basalts, evaporates and soils. The instrument is being built at NASA Ames Research Center in the San Francisco Bay Area. The principal investigator and the CheMin data analysis center are at NASA Ames. Some of the instrument hardware is being developed at JPL. Those are the two lead institutions for the CheMin investigation. Scientific co-investigators are located at an additional 9 institutions, including Los Alamos National Laboratory in New Mexico. Jack Farmer, director of Arizona State Universtiys astrobiology program and a professor of geological sciences, is a member of the science team for CheMin.